A lot has happened since the last full edition of the LiveWorkPlay Blog on April 12. It's not overstating the case to say that in the last two months there has been more excitement than could reasonably be expected from an organization of our size in an entire year! Linda Gray and Moira Fuenzalida did a great job advocating against the proposed changes. The Recipe for Success Culinary Adventure and Charity Auction on April 14 not only raised an amazing $44,000 but attracted a huge audience of newcomers that included notables like MPP Yasir Naqvi and Councilor Scott Moffat. Our special guest speaker Mayor Jim Watson got the audience warmed up for our amazing co-hosts Derick Fage of Daytime on Rogers Television and Sandy Sharkey from 93.9 BOB FM. For the first time the event featured live tweeting (with Naqvi, Moffat, and Watson helping stir things up) and quite a buzz was created, with members of the public texting LiveWorkPlay staff hoping to buy their way in to the event well after registration was closed. We'd have been happy to accommodate them but there was not a chair to spare! St. Anthony's Banquet Hall served up delicious appetizers while LiveWorkPlay members and families brought scrumptious home made desserts! Reporter Diane Sawchuck was on site throughout the evening (and also took part in the live tweeting) and compiled an extensive article for EMC News that you can read here for more about this wonderful evening! United Way Ottawa, Our New Employment Partner! Just a few days after Recipe for Success the good news was announced that LiveWorkPlay will be receiving $42,000 per year over the next three years from United Way Ottawa. The funding will contribute to LiveWorkPlay efforts to help adults with intellectual disabilities find and keep paid employment, and also help with a new initiative - supporting youth with intellectual disabilities who are still in school to development their employment readiness and pursue summer employment. With this news LiveWorkPlay was able to confirm that Mathieu Nadeau - who had been filling in for Jennifer Bosworth during her maternity leave - will continue on. In other words, we now have 2 full-time staff members providing Employment Supports! It's been a busy time for Mat and Jen, who have been busy helping members find and keep jobs in the Ottawa community, but also attending the Canadian Association for Supported Employment (CASE) conference in Halifax. Jennifer also realized a goal of hosting Joe Dale from the Ontario Disability Employment Network and Rotary at Work program. Joe made a tour of 5 local clubs and with Jennifer's facilitation met up with various local employers, employment supports providers, and funders to share his positive message about employment and people with disabilities. After many years of cooperative dialogue LiveWorkPlay is pleased to announce a formal partnership with Families Matter Co-op. LiveWorkPlay has been contracted to facilitate community participation for 8 individuals with intellectual disabilities who are residing at the McLean Housing Co-op. Families Matter Co-op created these housing opportunities by partnering with McLean as well as obtaining funding from the Ministry of Community and Social Services through the Innovative Residential Model initiative. You can read more about this initiative from this article in the newsletter of the Co-Operative Housing Federation of Canada. On April 29 six LiveWorkPlay adult members hit the road on a coach bus trip to North Conway, New Hampshire, with co-leaders Julie Kingstone and Keenan Wellar along for the ride in support. The LiveWorkPlay group was just a part of the tour, with another 30 or so citizens from the Ottawa area along for the ride. The three-day trip worked out great, not only because of the shopping and the beautiful sites of the White Mountains region, but because of the company! In fact, the trip went so well, that for 2011-2012 there will be three LiveWorkPlay trips with Ottawa Valley Tours - Nashville, Quebec City, and a Caribbean cruise! Group travel through airports has proven very stressful over the past few years, but perhaps more importantly, there aren't very many chances to get to know other people along the way. The bus tours avoid the airport stress, but also offer a completely different social experience. One of the goals of LiveWorkPlay travel is to help our members acquire the skills and experience to enjoy more independent travel (if that is one of their interests). Learning how to take part in bus tours will be for many a much easier way to get started. "I can picture many our members travelling with a friend on one of these tours," said Julie. "They are relatively affordable, and they combine an element of independence with the company of others and the reduced stress that comes from having a guide that supports everyone to enjoy the itinerary." LiveWorkPlay benefited from the fundraising efforts of the HockeyFest III tournament at the University of Ottawa, featuring players in their 60s, 70s, and 80s! The tournament took place from May 4-6, wrapping up with a banquet on May 7. LiveWorkPlay contributed to the event with a surprise slide show presentation that included live footage of the induction ceremony for players joining the ranks of the octogenarians! About $2500 was raised for LiveWorkPlay! LiveWorkPlay believes that the voice of self-advocates is critical to helping communities learn how to welcome and value people with intellectual disabilities. To that end, we are supporting the growth of People First Ottawa, a new chapter that LiveWorkPlay helped launch in November. 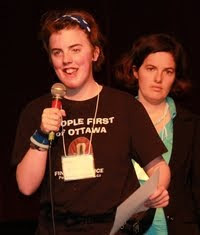 People First Ottawa hosted a very successful "movie and discussion night" on May 15 featuring the film Monica & David. Two weeks later the People First Ottawa board of directors took part in the Peterborough People First conference along with another 100 delegates mainly from across Ontario. Keenan Wellar had the honour of being keynote speaker at the conference, where he explained his motivations as a personal supporter of People First (volunteering as an advisor at the local and provincial level) and also why it is important for LiveWorkPlay. "People with intellectual disabilities are victims of the medical model of thinking whereby their disability is to blame for any marginalization they are experiencing," said Keenan. "Well, nobody in this room is broken. You all deserve respect as fully valued human beings, and you are not to blame if you are excluded from housing, jobs, education, relationships, or anything else. We support your efforts to speak out for yourselves and follow your dreams." Ottawa Race Weekend saw the realization of a wonderful social media outcome! Volunteers Andrew Waye and Andrea Saldanha proposed on the LiveWorkPlay facebook group that they were going to be in training for the race, and wondered if any other volunteers or members would like to get involved. Volunteer Pennie Styan jumped in along with members Tim Siebrasse, Jalynn Plaus, and Emily Menard. They met on Wednesday evenings throughout the spring and soon enough they were off and running! This was never planned as a fundraiser, but people were quite inspired by the initiative shown by Andrew and Andrea and they presented LiveWorkPlay with $1000 in donations! The annual Engines of Success recognition banquet came early this year but nobody seemed thrown off by the June 2 date, which avoided conflict with everything from school exams to family vacations that get in the way later in the month when the event has traditionally been held. There was an enthusiastic crowd of 200 on hand for a delicious meal at St. Anthony's Banquet Hall that was accompanied by recognition for our members, partners, and families, as well as the presentation of awards. The agenda was beautifully managed by Julie Kingstone and the evening finished early - not that anyone minded, it was a great night and many people stayed around and continued the celebration well after the closing remarks! Fran Childs and a supporting cast of LiveWorkPlay staff members put together a recognition slide show for over 100 volunteers! It was a record year for volunteer engagement and the audience sat up and took notice of the diversity of the individuals involved not to mention the wide range of areas in which they are supporting the organization and its members. The awards ceremonies created a lot of excitement, some surprises, some laughter, and some tears! Shock of the night went to outgoing Families Matter Co-op Executive Director Marge McCabe who was presented with a Legacy Award for her decades of service to people with intellectual disabilities and family members. The Media Award went to Daytime Ottawa (Rogers Television) represented by Derick Fage. He held up very well on the night of the banquet but next morning he and co-host TL Rader were clearly a bit choked up discussing the award on air! The award was well deserved recognition for their respectful coverage of people with intellectual disabilities and related issues in the Ottawa community. Ambassador Awards went to Kyle Berthiaume, Emily Menard, and Ryan Nevitt, in recognition for their public representation of LiveWorkPlay and its values. Good Life Awards went to Heather McAdam, Chris Jones, and Amanda Manuel, each of whom dealt with significant challenges this past year but overcame them and continued to follow their dreams. Also acknowledge was Chair of the Board Marlene Floyd, who was recently honoured with recognition by a provincial Leading Women Building Communities Award and a Y Women of Distinction Award. None of our youth or adult members went home empty-handed on this night thanks to Barry Wellar of Wellar Consulting who sponsored a movie pass for all in attendance! Thanks once again to the Harris family for hosting the annual BQQ Blast-Off Pool Party, the official launch of summer in the culture of LiveWorkPlay. There was a huge turnout of about 80 people for this little backyard gathering! There was a bit of added excitement this year when one of the great LiveWorkPlay traditions - the annual cannonball contest - came to an early end when the diving board was snapped in half! Daniel Harris did the honours and is now a legend. When the trip was planned nobody knew that Boston would be celebrating a Stanley Cup victory, but LiveWorkPlay youth members arrived in Beantown on June 20 to find the city in a jovial and welcoming mood! 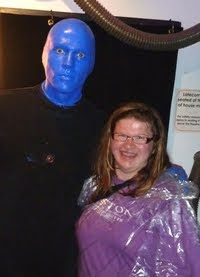 The trip included two shows (Blue Man Group and Shear Madness) as well as visits to one of the world's best aquariums (see who touched a shark), whale watching, and a tour of the legendary Fenway Park baseball stadium. Check out the "four days in four minutes" video highlights! Last but not least, the LiveWorkPlay board of directors is preparing for a September 23 Annual General Meeting where among other business they will be proposing a new vision, mission, and values to the membership. VISION: A community where everyone belongs. Value - CORE: People with intellectual disabilities are valuable contributors to the diversity of our community and to the human family. Value - LIVE: On an equal basis with others in our community, people with intellectual disabilities have the right to homes, health care, and education in the community, as well as personal dignity and protection from invasion of privacy. Value - WORK: On an equal basis with others in our community, persons with intellectual disabilities have the right to paid work at minimum wage or better, short-term unpaid work, and volunteer positions in the community. Value - PLAY: On an equal basis with others in our community, persons with intellectual disabilities have the right to take part in cultural and spiritual life, sports and recreation, political life, and the full range of human relationships. "We have done some draft work on the detailed principles that will flow from our values statements," says chairperson Marlene Floyd, "but we really want to hear from our members, supports, partners, and anyone who cares to take the time to offer their opinion." Feedback on the proposed statements can be sent to chair@liveworkplay.ca. Although there are elements of originality to these statements, they have direct linkages to the United Nations Convention on the Rights of Persons with Disabilities and are also reflective of current day best practices as described in the first ever World Report on Disability from the World Health Organization as well as years of research and advocacy work by our partners at Community Living Ontario, Canadian Association for Community Living, and Inclusion International. LiveWorkPlay uses Facebook, YouTube, and Twitter as well as other social media channels to connect with individuals and organizations in the local, provincial, national, and international community. LiveWorkPlay social media efforts are lead by LiveWorkPlay co-leader Keenan Wellar, who had a very busy spring with many speaking engagements on this and other topics. This included a presentation at MARCOM 2011 that Keenan shared with Stacey Diffin-Lafleur from United Way Ottawa, as well as a solo presentation at Canadian Business & Community Partnership Forum where Keenan was also part of an interesting podcast that you can listen to or download on iTunes!